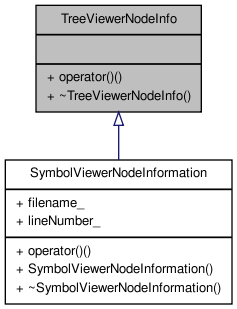 Derive from this class to implement data associated with tree viewer nodes. New up objects of your derived type and give them to tree viewer nodes using TreeViewerNode::adoptInfo(TreeViewerNodeInfo *); When the node gets deleted, the node info will get deleted. Definition at line 45 of file treeviewer.h. Definition at line 1117 of file treeviewer.cxx.